November 27, 2017 – This week, our time machine visits the Gilded Age to witness William McKinley’s rise to the White House. Little remembered or misremembered today, at the time of his assassination in 1901, the Civil War veteran was the most popular president since Abraham Lincoln, and nothing like the caricature portrayed by mid-20th Century authors. 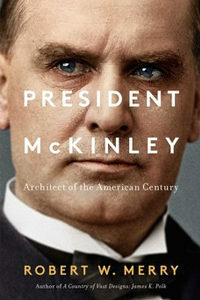 Robert W. Merry sets the record straight in President McKinley: Architect of the American Century . You’ve seen Mr. Merry was editor of The National Interest from 2011 to 2013, and previously served as a Washington correspondent for the Wall Street Journal and executive editor of the Congressional Quarterly. He’s now editor at The American Conservative. You’ve seen his work everywhere from the New York Times to National Review, and seen his appearances on shows like Meet the Press. His previous book resurrected another overlooked president: A Country of Vast Designs , on James K Polk, and Where They Stand: The American Presidents in the Eyes of Voters and Historians . Also mentioned this week: Our interview with Candice Shy Hooper, author of Lincoln’s Generals’ Wives: Four Women Who Influenced the Civil War–for Better and for Worse .